Use this worksheet to practice finding the volume and surface area of a right circular cylinder. Adjust the height and radius using the labeled sliders. Answer the questions below. Click the check boxes to find helpful hints and verify your answers. 1. 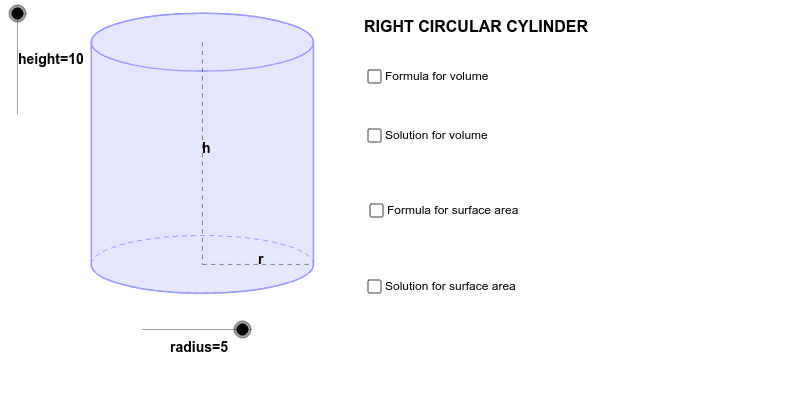 Find the volume and surface area for 5 different right circular cylinders by randomly choosing different heights and radii. 2. Find the missing dimensions below. Round to the nearest unit. a. Cylinder: volume is 700 cubic meters, diameter is 8.8 meters, height ___ b. Cylinder: surface area is 222.5 square inches, radius is 4.3 in, height ___ 3. Gift Wrapping: Juliet is trying to wrap a can of mixed nuts that is a birthday gift for her brother. The can has a radius of 4.5cm and a height of 9.7 cm. Approximately how many square centimeters of wrapping paper will cover the gift?